This article is about the Japanese manga. For the feature film adaptation, see Uzumaki (film). For the Naruto character, see Naruto Uzumaki. Uzumaki (Japanese: うずまき, Spiral) is a seinen horror manga series written and illustrated by Junji Ito. Appearing as a serial in the weekly manga magazine Big Comic Spirits from 1998 to 1999, the chapters were compiled into three bound volumes by Shogakukan and published from August 1998 to September 1999. In March 2000, Shogakukan released an omnibus edition, followed by a second omnibus version in August 2010. In North America, Viz Media serialized an English-language translation of the series in its monthly magazine Pulp from February 2001 to August 2002. Viz Media then published the volumes from October 2001 to October 2002, with a re-release from October 2007 to February 2008, and published a hardcover omnibus edition in October 2013. The series tells the story of the citizens of Kurōzu-cho, a fictional city which is plagued by a supernatural curse involving spirals. The story for Uzumaki originated when Ito attempted to write a story about people living in a very long terraced house, and he was inspired to use a spiral shape to achieve the desired length. Ito believes the horror of Uzumaki is effective due to its subversion of symbols which are positively portrayed in Japanese media, and its theme of protagonists struggling against a mysterious force stronger than themselves. The manga was adapted into two video games for the WonderSwan and a Japanese live-action film directed by Higunchinsky. The manga has received generally positive reviews from English-language critics. It was nominated for an Eisner Award in 2003, and placed in the Young Adult Library Services Association's list of the "Top 10 Graphic Novels for Teens" in 2009. 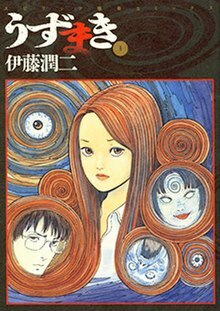 Uzumaki follows a high-school teenager, Kirie Goshima (五島桐絵); her boyfriend, Shuichi Saito (斎藤秀一); and the citizens of the small, fictional Japanese town of Kurōzu-cho (黒渦町, Black Vortex Town), which is cursed by supernatural events involving spirals. As the story progresses, Kirie and Shuichi witness how the spiral curse affects the people around them, causing the citizens to become obsessed or paranoid about spirals. Eventually Kirie is affected by the curse as well, when her hair begins to curl into an unnatural spiral pattern, drains her life energy to hypnotize the citizens, and chokes her whenever she attempts to cut it off. Shuichi is able to cut her hair and save her. Several citizens begin developing spirals on their backs, which continue growing until the afflicted people have turned into monstrous snails - this eventually affects Kirie's younger brother, Mitsuo. The curse continues to plague the town, until a storm conjured by the curse destroys most of its structures. The only remaining buildings are ancient abandoned terraced houses, which the citizens are forced first to move into, and then begin expanding as they grow more and more crowded. Kirie and Shuichi devise a plan to escape Kurōzu-cho, but when they attempt to escape, their efforts are unsuccessful. After returning to the town, they discover that several years have passed since they left, as time speeds up away from the spiral. The other citizens have expanded the terraced houses until they connect into a single structure forming a spiral pattern. Kirie and Shuichi decide to search for Kirie's parents, which brings them to the center of the spiral. At the center, they fall down a pit, within which they discover corpses of people whose bodies have been twisted into spirals - including Kirie's parents - and an ancient city completely covered with spiral patterns. Shuichi urges Kirie to move forward and find a way to stop the curse, but she replies that she does not have the strength and wishes to stay with him. The two embrace each other, and their bodies twist and wrap together as a result of the curse. As they lie together, Kirie notes that the curse ended at the same time it began, for just as time speeds up away from the center, it freezes at the center, and concludes that the curse is eternal, and all the events will repeat when a new Kurōzu-cho is built where the previous one lay. Uzumaki was written and illustrated by Junji Ito. Junji Ito's initial desire was to create a story about strange changes that would occur to people living in a very long, traditional Japanese terraced house. This story would have been based on Ito's personal experience living in such a house as a child. During the process of finding a way to draw such a long building, Ito was inspired by the shape of a mosquito coil and decided he could make the building long by having it spiral. Ito has noted that the spiral is a "mysterious pattern" and described writing Uzumaki as an attempt to learn the secrets of the spiral. Ito sought inspiration by methods such as staring at spirals, researching spirals, creating spiral patterns by draining water from bath tubs, eating foods with spiral patterns, and raising snails. Looking back on the series in 2006, Ito stated that while he was still uncertain what the spiral stood for, he thought it might be representative of infinity. Uzumaki was influenced by the positive representation of spirals in media, which inspired Ito to subvert them to create horror, stating: "Usually spiral patterns mark character's cheeks in Japanese comedy cartoons, representing an effect of warmth. However, I thought it could be used in horror if I drew it a different way." The story in which Kirie's hair is cursed by the spiral reflects a recurring theme in Ito's work in which a heroine's hair has a life of its own. Ito uses this imagery because it lends itself well to horror due to its association with the Japanese feminine ideal (Yamato nadeshiko), as well as the unnerving flowing motions of long hair, which he describes as snakelike. Ito also noted that horror writer H. P. Lovecraft was one of his inspirations when creating Uzumaki, stating that the gradual development of the spiral curse was patterned on Lovecraft's storytelling and that "[Lovecraft's] expressionism with regard to atmosphere greatly inspires my creative impulse." The manga began as a serial in the weekly manga magazine Big Comic Spirits from 1998 to 1999. Shogakukan compiled the chapters into three bound volumes and published them from August 1998 to September 1999. To celebrate the release of the live-action film, the manga series was released in an omnibus volume in March 2000, with an additional "lost" chapter. Shogakukan released another omnibus edition on August 30, 2010, with the same content and additional commentary from Masaru Sato. In North America, Viz Media serialized an English-language translation of the series in its monthly magazine Pulp from the February 2001 issue to the August 2002 issue. It published volumes of the series from October 2001 to October 2002. Viz Media re-released the series with new covers from October 2007 to February 2008, and published the omnibus volume in hardcover with twelve color pages on October 13, 2013. The series has also been translated into other languages, such as Spanish, French, Brazilian Portuguese, Polish, Swedish, Mandarin, Korean, and Serbian. ^ The chapter was not originally included in the original Japanese release but in the subsequent omnibus editions. In North America it was included in the third volume. Two video games were developed and published by Omega Micott for the Bandai WonderSwan. The first, Uzumaki: Denshi Kaiki Hen (うずまき 〜電視怪奇篇〜, Spiral -Power Vision Strange Edition-), was released on February 3, 2000 and is a visual novel retelling the events of the manga. Kirie Goshima's actor, Eriko Hatsune makes a special appearance. The second game, titled Uzumaki: Noroi Simulation (うずまき 〜呪いシミュレーション〜, Spiral -Curse Simulation-), was released on March 4, 2000 and is a simulation game. Players are tasked by the Uzumaki Sennin (うずまき仙人, Spiral Master) to spread the spiral curse. The objective is to spread the curse across the town and find hidden objects to gain more "Spiral Power" and progress the story. The title also includes a mini-game involving one of the snail-human hybrids. In 2000, a live-action adaptation of Uzumaki was released in Japan. Directed by Higunchinsky, it featured Eriko Hatsune as Kirie Goshima, Shin Eun-kyung as Chie Maruyama, Fhi Fan as Shuichi Saito, Keiko Takahashi as Yukie Saito, Ren Osugi as Toshio Saito, and Hinako Saeki as Kyoko Sekino. The film consists of four parts ("A Premonition", "Erosion", "Visitation", and "Transmigration"), and as a result of being produced before the manga's conclusion, uses a different ending than the manga. Uzumaki was nominated for an Eisner Award in the category of "Best U.S. Edition of Foreign Material" in 2003. The Young Adult Library Services Association chose the first volume for its list of the "Top 10 Great Graphic Novels for Teens" in 2009. The manga was also included on its list of the 53 "Great Graphic Novels for Teens". Viz Media's Deluxe edition ranked #172 in Diamond's Top 300 Graphic Novels on October 2013 with a total of 784 copies sold. IGN placed Uzumaki at #2 under their "Top 10 Horror/Thriller Manga" list. About.com's Deb Aoki placed Uzumaki in her list of recommended horror manga, describing it as a classic of the genre. Uzumaki appeared in 1001 Comics You Must Read Before You Die (2011), and the reviewer wrote that it reminded him of the works of H.P. Lovecraft. MyM magazine praised the manga, calling it "one of the scariest manga series around." In Manga: The Complete Guide (2007), Jason Thompson gave Uzumaki three and a half stars, and wrote that, taken as a whole, the manga succeeds as "an elegant and sometimes blackly humorous story of dreamlike logic and nihilism." Thompson featured the manga again in his House of 1000 Manga blog, praising it for its originality, in that it revolved around "a certain nightmarish, fatalistic way of looking at the world". Comics Alliance author and comic artist, Sara Horrocks, also praised the manga, stating "What makes Uzumaki such a strong work is how precise it is in it’s mechanics. It is meticulous in the way that a curse might be." For the first volume, Theron Martin from Anime News Network gave it a 'B', praising the art style and character designs, including Viz Media's new cover design. He stated, however, that "some of the attempts at horror get too preposterous for their own good." Greg Hackmann of Mania gave it an A, praising both its "well-honed" art and Ito's ability to form an effective overarching plot out of Uzumaki's loosely connected substories. Barb Lien-Cooper of Sequential Tart gave it a 7 out of 10, stating "The art is clean and simple. It works to help maintain the paranoia. The tone and pacing of this story are also just right. Altogether, one of the better horror stories I've read this year." Ken Haley of PopCultureShock gave it an 'A' and praised Ito's effective use of body horror, though he noted that some of the curse's effects were more humorous than frightening. For the second volume, Lien-Cooper gave it 8 out of 10 stating, "What astounds me about Junji Ito's work is its deceptive simplicity and its flawless execution." Sheena McNeil, also from Sequential Tart, instead gave it a 9 out of 10, citing the novel effects of the curse Ito invented. Hackmann, however, gave it a 'B', explaining that "Unfortunately, this shift in story format is largely a failed experiment: with the overarching escape storyline put on hiatus, a good number of these disconnected episodes degenerate into simple, "lookit, weird stuff happening" horrorfests that lack much of the creative spark exhibited throughout the first Uzumaki collection." When reviewing the third and final volume, Haley again gave it an 'A', praising Junji Ito for providing answers to questions previously asked but not answered in a heavy or mundane form. Lien-Cooper gave the conclusion a 6 out of 10, and criticized the initial ending as nonsensical and the expanded background given in "Galaxies" as uninteresting. ^ Douresseaux, Leroy (December 26, 2016). "Tomie Complete Deluxe Edition manga review". ComicBookBin. Retrieved July 27, 2018. ^ "The Official Website for Uzumaki". Viz Media. Retrieved July 27, 2018. ^ a b Thompson, Jason (2007-10-09). Manga: The Complete Guide. Del Rey Manga. p. 383. ISBN 978-0-345-48590-8. ^ Jonathan Ross (2007-04-16). "Kaidan". Japanorama. Series 3. Episode 5. Hotsauce TV. BBC Choice/BBC Three. Retrieved 2014-05-05. ^ "Ghost Story Roundtable". Da Vinci Magazine. 10 (7): 184, 185. July 2003. ^ Ito, Junji (2001-10-06). "Afterword". Uzumaki. Viz Media. pp. 204, 205. ISBN 1-4215-1389-7. ^ a b Mira Bai Winsby (2006-03-01). "Into the Spiral - A Conversation with Japanese Horror Maestro Junji Ito". Translated by Miyako Takano. 78 Magazine. Retrieved 2014-04-18. ^ a b "VIZ Media Releases a Deluxe, Hardcover Omnibus Edition of Junji Ito's Celebrated Horror Manga Uzumaki". Anime News Network. 2013-10-18. Retrieved 2014-04-23. ^ a b Thompson, Jason (2011-06-30). "Jason Thompson's House of 1000 Manga - Uzumaki". House of 1000 Manga. Anime News Network. Retrieved 2014-04-18. ^ a b うずまき 1 (in Japanese). Shogakukan. Retrieved 2014-04-12. ^ a b うずまき 3 (in Japanese). Shogakukan. Retrieved 2014-04-12. ^ うずまき (ビッグコミックス ワイド版) (in Japanese). Amazon.co.jp. Retrieved 2014-04-24. ^ うずまき (in Japanese). Shogakukan. Retrieved 2014-04-12. ^ "Pulp :: New Japanese Pop Culture Monthly". Pulp. Viz Media. Archived from the original on February 2, 2001. Retrieved 2014-04-23. ^ "Pulp Ends in August". Anime News Network. 2002-04-11. Retrieved 2014-04-23. ^ a b "Uzumaki: Spiral into Horror Volume 1". Barnes & Noble. Retrieved 2017-04-14. ^ a b "Uzumaki: Spiral into Horror Volume 3". Barnes & Noble. Retrieved 2017-04-14. ^ a b "Uzumaki, Vol. 1 (2nd Edition)". Viz Media. Archived from the original on February 7, 2010. Retrieved 2014-04-15. ^ a b "Uzumaki, Vol. 3 (2nd Edition)". Viz Media. Archived from the original on February 24, 2008. Retrieved 2014-04-15. ^ "Uzumaki nº 01/6" (in Spanish). Planeta DeAgostini. Retrieved 2014-06-03. ^ "Spirale" (in French). Tonkam. Retrieved 2014-04-23. ^ "Uzumaki -Volume 2" (in Portuguese). Conrad Editora. Archived from the original on 2006-11-04. Retrieved 2014-04-23. ^ "Uzumaki" (in Polish). Japonica Polonica Fantastica. Retrieved 2014-06-03. ^ "Uzumaki Spiralerna del 1" (in Swedish). Galago. Retrieved 2014-04-23. ^ 《漩渦》 1-3集完 (in Chinese). Tong Li Publishing. Retrieved 2014-04-23. ^ 소용돌이 1~3(완) (in Korean). Sigongsa. Retrieved 2014-04-23. ^ "Uzumaki 1 - Spirala užasa" (in Serbian). Darkwood. Retrieved 2014-04-29. ^ うずまき 2 (in Japanese). Shogakukan. Retrieved 2014-04-12. ^ "Uzumaki: Spiral into Horror Volume 2". Barnes & Noble. Retrieved 2017-04-14. ^ "Uzumaki, Vol. 2 (2nd Edition)". Viz Media. Archived from the original on March 15, 2008. Retrieved 2014-04-15. ^ "うずまき~電視怪奇篇~ WS 【ワンダースワン】" (in Japanese). Amazon.co.jp. Retrieved 2014-04-12. ^ うずまき 〜電視怪奇篇〜 (in Japanese). Swan.Channel.or.jp. Retrieved 2014-04-16. ^ "う ずまき~呪いシミュレーション~ WS 【ワンダースワン】" (in Japanese). Amazon.co.jp. Retrieved 2014-04-12. ^ うずまき 〜呪いシミュレーション〜 (in Japanese). Swan.Channel.or.jp. Retrieved 2014-04-16. ^ a b Mitchell, Elvis (2002-05-01). "Movie Review – Uzumaki – Film Review". New York Times. Retrieved 2014-04-21. ^ "Few Manga at Eisner Awards". Anime News Network. Retrieved 2014-04-12. ^ "Librarians Honor Sand Chronicles, Real, Uzumaki, Japan Ai". Anime News Network. 2009-01-28. Retrieved 2014-04-12. ^ "Great Graphic Novels for Teens". ICv2. 2009-01-29. Retrieved 2014-04-12. ^ "Top 300 Graphic Novels Actual--October 2013". ICv2. Retrieved 2014-04-12. ^ A. E. Sparrow (2007-10-30). "Top 10 Horror/Thriller Manga". IGN. Retrieved 2014-05-31. ^ "Horror Manga: 13 Creepy Comics and Gruesome Graphic Novels". About.com. Retrieved 2014-04-23. ^ Gravett, Paul, ed. (2011). 1001 Comics You Must Read Before You Die. New York: Universe Publishing. p. 692. ISBN 0-7893-2271-4. OCLC 698332761. ^ Ian Wolf (November 2013). "Uzumaki Spiraling into Madness". MyM (20): 70. ISSN 2049-8187. ^ Sarah Horrocks (2013-05-30). "The Horrific Mechanations of Junji Ito's Uzumaki". Mercurial Blonde. Retrieved 2014-04-15. ^ Martin, Theron (2008-01-03). "Uzumaki GN1 review". Anime News Network. Retrieved 2014-04-12. ^ Greg Hackmann (2007-12-14). "Uzumaki Vol. #01". Mania. Archived from the original on 2009-02-01. Retrieved 2014-04-16. ^ Barb Lien-Cooper (2002-02-01). "Uzumaki Vol. 1". Sequential Tart. Retrieved 2014-04-16. ^ Ken Haley (2007-10-10). "Manga Recon Spooktacular: Uzumaki and Gyo". PopCultureShock. Archived from the original on July 1, 2010. Retrieved 2014-04-19. ^ Barb Lien-Cooper (2002-08-01). "Uzumaki Vol. 2". Sequential Tart. Retrieved 2014-04-16. ^ Sheena McNeil (2002-08-01). "Uzumaki Vol. 2". Sequential Tart. Retrieved 2014-04-16. ^ Greg Hackmann (2007-12-04). "Uzumaki Vol. #02". Mania. Archived from the original on 2009-04-21. Retrieved 2014-04-16. ^ Ken Haley (2008-01-31). "Manga Minis, January 2008". PopCultureShock. Archived from the original on July 1, 2010. Retrieved 2014-04-19. ^ Barb Lien-Cooper (2002-12-01). "Uzumaki Vol. 3". Sequential Tart. Retrieved 2014-04-16.